Trash Receptacle or Recycling Unit? You Pick. 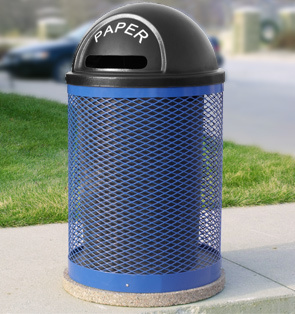 Made of recycled materials, this commercial trash receptacle would love be used as a recycling unit, but it works just as great as a trash receptacle for everyday waste. You pick the lid. Double sided dome top lid can be customized with your choice of decal lettering and cutout for recyclables: a horizontal slot for paper or circular opening for cans and plastic. An open cutout with no label is for regular trash disposal. The diamond patterned recycled steel body is powder-coated in your choice of colors shown. The concrete base on which the expanded steel body is mounted is made of fly ash concrete which would otherwise end up in landfills. The base is also available in a wide variety of colors and finishes shown below. Recycled Plastic Dome Top Lid. Recycled Fly Ash Concrete Base.